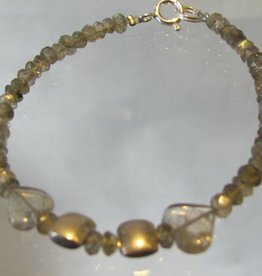 These bracelets are made of handcut and faceted semi precious stones and interspaced with hand made silver beads. The closings are also made of silver. They are all threaded on strong nylon coated steel cabel which makes them very robust. 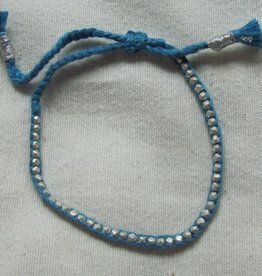 Pretty little friendship bracelet made with hand made silver beads and coloured cord. 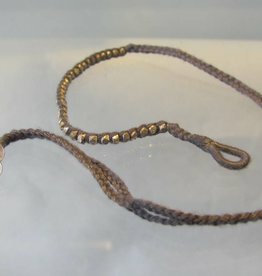 Adjustable bracelet. Fits all sizes. 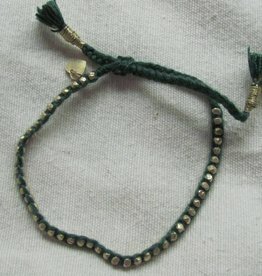 Give this handmade friendship bracelet to your best (girl)friend and make her really happy. Fairly traded from India. 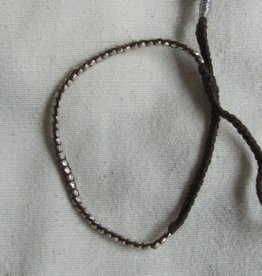 Pretty little friendship bracelet made with hand made silver spacer beads and coloured knotted cord. 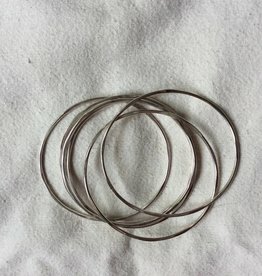 Adjustable bracelet. Fits all sizes. 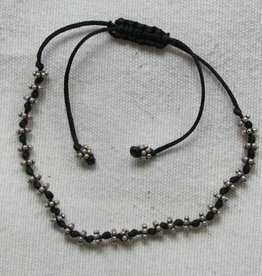 Give this handmade friendship bracelet to your best (girl)friend and make her really happy. Fairtrade India. 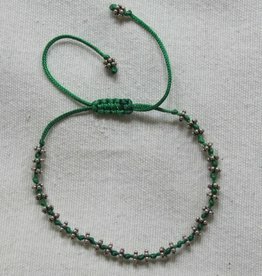 Pretty little friendship bracelet made with hand made silver spacer beads and coloured knotted cord. 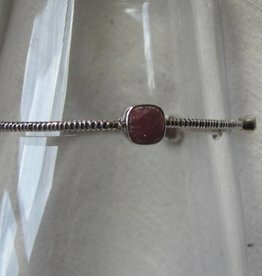 Adjustable bracelet. Fits all sizes. 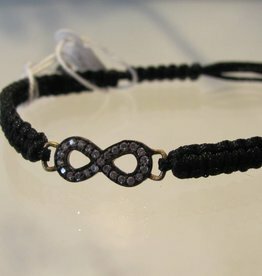 Give this handmade friendship bracelet to your best (girl)friend and make her really happy. 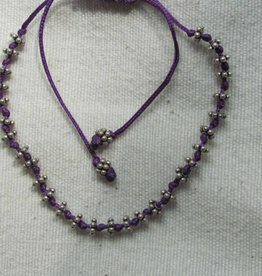 Pretty little friendship bracelet made with hand made silver spacer beads and coloured knotted cord. Adjustable bracelet. Fits all sizes. 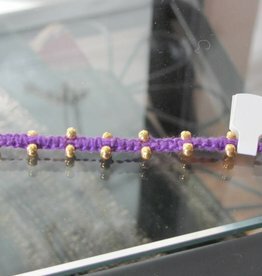 Fine macramé bracelet purple with gold on silver beads and a pink wild pearl closing. Length 17 cm. Adjustable bracelet. Fits all sizes. Thin cord with an Ajna Chakra medallion in hand made silver. In the middle is an eeny weeny facet cut amethyst. Plated bracelet can go around the wrist twice. Or makes a very attractive choker on a thin (and young) neck. 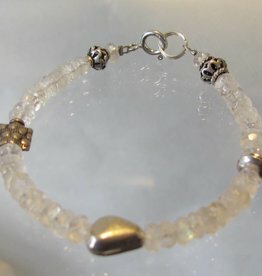 Lots of faceted silver beads are plated into this special bracelet. The button for closing is also silver. Length 34 cm. 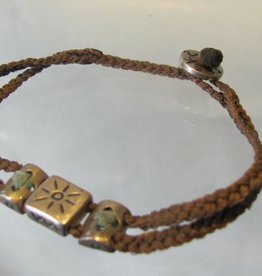 Plaited bracelet with hand made silver beads and silver button closing. Length 18 cm. 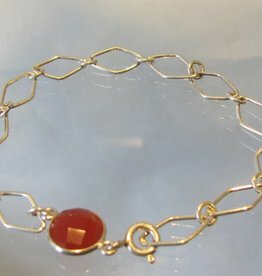 Pretty hand made silver links and a facet cut cornelian make this a simply beautiful bracelet. Length 20,5 cm (you can adjust it shorter). 20cm long. 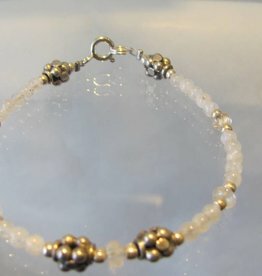 Each link is made by hand on this beautiful silver bracelet and finished with facet cut cornelians to embelish your wrist. 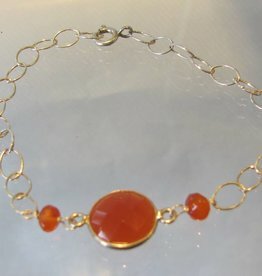 20,50 cm long ( you can adjust him shorter) Pretty hand made silver links and a facet cut cornelian make this a simply beautiful bracelet. 17,50cm long. 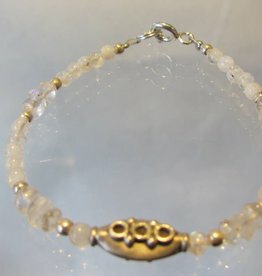 This bracelet of hand cut and faceted rainbow moonstones combined with hand made silver beads is really unusual. Strung on strong steel cabel with a silver closing.